धातुरहस्य (Dhāturahasya) – Unfolding the secret of root sounds in Sanskrit – An Introduction. I plan to post day-by-day learnings out of this workshop. So these are just notes that I’ve scribed during the sessions for my future reference. As a side-effect, you may benefit from it. However, as I’m learning Sanskrit, there may be many mistakes or loss during translation, so be cautious. In other words, mistakes are entirely mine! At some places, there are things that I’ve added and I’ll state it explicitly. At the outset, I would also like to thank Dr. Sampadananda Mishra for taking the time out and offering to correct the posts whenever his schedule permits him. Accordingly, I’ll make corrections and improve it. He is yet to correct this post (once he reviews it, I’ll remove this line). 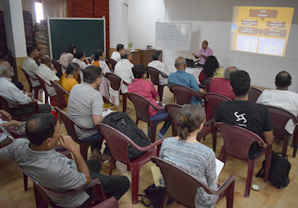 Like the earlier workshops after the introductions, he told us how he conceived the idea of this workshop and how and why he arrived at the name धातुरहस्य (Dhāturahasya) for this workshop. Sampadanandji made it clear that he is not going to deal with the deeper technicalities of धातु (Dhātu) from the grammatical tradition of Panini, although this will be discussed. Though the workshop has technical sessions, but much of the focus will be on the deeper philosophical aspects. 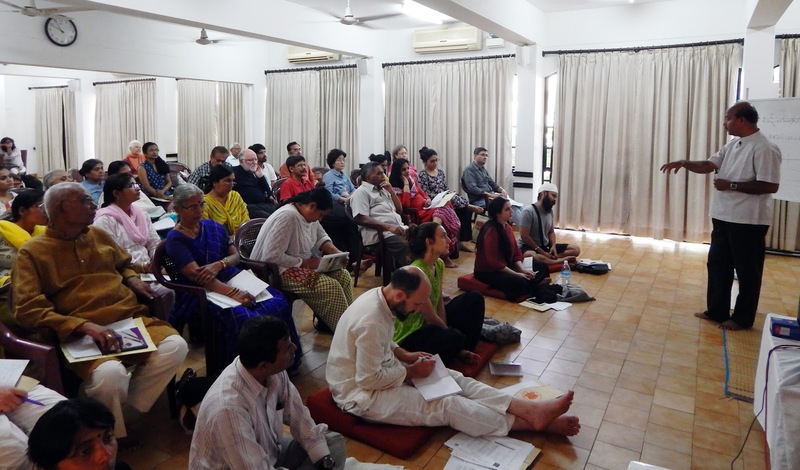 What he mainly intends to give the participants is the philosophy behind the root sounds and he said this is what he has learnt from Sri Aurobindo’s writings. After reading Sri Aurobindo’s essays on the Gita, Upanishads and the Vedas, he said that he found a tremendous depth and once having been at that depth, one does not want to return back to refer/hear any other commentaries. Sri Aurobindo has given a clear insight that until we go to the very root of the experience behind every thing, it is extremely difficult to understand the spirit behind those experiences that are manifested in the form of mantras or the experiences that are brought forth in the Vedas in the form of language. Sampadanandji pointed out further that in every aspect of our day-to-day life here at the Sri Aurobindo Society, we begin with Silence. He says that this Silence is the ultimate source of the all the speech world! So how do we enter in to that world? This further lead to an enquiry by Sampadanandji that how Sri Aurobindo was able to learn Sanskrit in just few months and how our ancient yogis understood almost all languages? They even understood the language of the inanimate objects! How The Mother understood the language of the flowers? She has given spiritual significance of almost 900 flowers! When she was questioned how was she able to do that? She replied saying that in deeper contemplation she would enter in to the very Consciousness of the flowers and listen to their languages. In this way she has created a new language of sadhana by going deep into the very consciousness of the flowers. So it is from this perspective that the study of the language needs to be approached. Also, it is not the mastery of the language which will help us go beyond and understand things. Many well-versed professors of English cannot understand what Sri Aurobindo has written. As people suggest, Sri Aurobindo’s English is considered to be top-grade, of extra-ordinary quality! In fact, this has been the experience of many people. On the other hand, there are people who have had no formal education, and they probably know very little English. But, they enjoy reading Sri Aurobindo and they explain it to others in a very simple and lucid manner. He also gave the example of Vashistha Ganapati Muni (a disciple of Sri Ramana Maharishi). He never took up study of English (as he was स्वदेशी [Swadeshi] kind of person), refused to look at English characters (on hoardings etc…), never signed in English – that level of strictness. However, he used to translate into Sanskrit the whole idea of The Secret of the Vedas of Sri Aurobindo. He translated entire Sri Aurobindo’s book – The Mother. When it was read out to Sri Aurobindo, he said that he must meet the Poet. He has brought out the spirit of the text. When someone asked Sri Aurobindo that even though the Muni did not know English, how could he possibly grasp, express and translate the whole essence of the book? Sri Aurobindo said – It is not the language which is the barrier, those who open themselves to the Truth they clearly see the Truth behind the symbols and the characters of the language. This was the secret even with Sri Aurobindo of how he mastered the whole language. So, in order to understand the language and take up the study of the language we must keep this in the background as a reminder. 3. Sanskrit – A Mantric Language. Ultimately, धातुरहस्य (Dhāturahasya) is rooted in the whole concept of Mantra. 5. Mechanism of word derivation from the root sounds. 6. Activity sessions on discovering the root sounds. 7. How to understand scriptures with the help of root sounds (not just a mental understanding) but by getting in to its spirit. It is extremely difficult to get into the spirit of the scriptures without delving deeper into the roots and the fundamental experiences associated with each of those sounds. If one does not do that, then it can lead to interpreting the scriptures quite differently, and eventually fail to bring out the coherence between what is said and what is meant (not the surface meaning, but stemming from the experiences behind the sounds). This is the main reason why we find multitude of interpretations for a given scripture. Something very unique to Sri Aurobindo is – he has presented the whole concept of root sounds, comparative philology in this light in the book Complete Works (new volume) – Vedic and Linguistic Studies recently published by Sri Aurobindo Ashram. So, how do we understand the secret of languages and in-turn understand ourselves and the world? But, why ourselves? This is because the entire aim of education in the ancient times and all the principles of education that Sri Aurobindo has laid down is all rooted in the vision of the Rishis that the sole aim of education is आत्मानं विद्धि (AAtmanam Viddhi) – Know thyself. If you study Panini’s text which is extremely technical or Vātsyāyana’s Kamasutra , or any text on Vaastu Shastra or any books on Physics, Chemistry, you will find that they have never deviated from this whole aim of आत्मानं विद्धि (AAtmanam Viddhi) – Know thyself. In Panini’s text, the philosophy of creation, the philosophy of Self and the language, the technique, the Grammar, the very way of presentation always are hand-in-hand and completely in harmony with each other. Before we approach study of any language, we need to understand that every language has its own स्वभाव (Svabhava – Extrinsic Nature), स्वधर्म (Svadharma – Unique Intrinsic Nature) and its own spirit. Just as every language has its own स्वभाव and स्वधर्म and spirit, so does Sanskrit. In the schools and institutes, where the language is taught formally, the first thing they do is teach the structure of the language – its grammar, parts of speech etc…, but they fail to dive deeper without giving any sense on the स्वभाव and स्वधर्म of the language itself. My personal note: This is one of the reasons why I come to Sri Aurobindo Society – SAFIC to learn Sanskrit. There are many commercial/non-commercial places where one can embark on their Sanskrit learning journey, but what I learn here is like drinking directly from the fountain. Sampadanandji further emphasized that – at present, whatever the ancient Rishis have communicated using their language is difficult to understand if we simply follow the mental understanding of it, i.e., by accepting the language in a very formal way (without diving deep into its स्वभाव and स्वधर्म). It will then look very different, and thus will leave a huge gap. However, if one enters in to the spirit of the language, by understanding the स्वभाव and स्वधर्म, then one can observe that there is a continuum in the language since its beginning. This has been maintained by Sanskrit through the times despite Vedic Sanskrit being different from Classical Sanskrit. Contextualizing it this to the workshop, it roughly translates as – Though you may know one word, know it well, use it in the right sense, at the right place and with the right attitude. If one feels this consciousness, the experiences and the force behind the sound, then you have achieved much more than the scholar who is fluent in Sanskrit, who can explain the shlokas, but is devoid of the feel for the spirit of the language. Sanskrit has been designed for self-realisation, in fact, it’s the language of self-realisation. Studying Sanskrit in its right way is to take up the Sadhana of self-realisation, it is आत्मानं विद्धि the vision of seers and sages. 1. Each word is self-explanatory. 2. It is a property-based language. 3. It is an inflectional language. Let us dwell on each. 1. Each word is self-explanatory: The first thing that anyone learns in a language are words. Have you ever wondered why a particular word is used in a particular sense? Most of the times we take it for granted, we don’t even ask this question. Lets look at English and take up the word – Hand. If we ask someone, do you know the meaning of the word Hand? Chances are you will be ridiculed. Its called Hand because it’s a Hand. Don’t you know that? So, basically you are not allowed to ask this question – Why a hand is called hand? You may find an answer when you look at the history of the language. Words in English are by and large imported from other languages or they have evolved out of convention that became sufficiently strong in use. For words that have evolved out of convention lack the inherent significance, that is, they are not self-explanatory. However, this is not true with Sanskrit and languages derived directly from Sanskrit. In Sanskrit, each and every word is self-explanatory. Sometimes, you don’t have to refer to dictionary! If you have a good introduction to the Dhātus (धातु), to the root sounds and the senses behind them, you don’t need to refer to dictionary every-time. The word itself will explain you why it stands for a particular object or an idea. This is the first important feature of the language. 2. It is a property-based language: Please refer to earlier workshop notes here. Sampadanandji reminded us that when using words in this language that they are property based, they deal with property and this must be consciously held in mind all the time. For example, he asked a wonderful question – What does the word ऐक (Eka) mean? ऐक (Eka) does not mean one as a mathematical value, but it means the property of being one. In which form ऐक (Eka) can be used? Is it singular, dual or plural? ऐक (Eka) means singular, but in Sanskrit we find plural form of ऐक (Eka) called ऐके (Eke). For example, the usage of singular form would be – ऐक: बालक: पठति (A boy is reading). We can also form sentence with plural form as – ऐके बालका: पठन्ति (A group of boys are reading). One can grasp this only when one looks it as a property. They have maintained the property of being one – as a group, as a unit or unity or harmonious aspiration as a group. So it means there is one group of boys doing certain action (in our case reading). When you pick up any entity from the same group, they represent the same thing, this is ऐके. This how we explain that though there are many boys, the property of being one is not lost. In a general sense, one can use ऐके where you have many maintaining the property of being a single unit. Similarly one can have singular form of सर्व (Sarva means all) and the plural form as सर्वे (Sarve) – it is the property of being all but taking care of the multiplicity. When one deals with this as property then only this can be explained. To understand we need to look at the property it describes and not the object. To enter into the property one has to go deep, decode, analyse and get into the root sound. Getting into the root sound is the first step and then there are subsequent steps to get into the spirit of the root sounds. A mere knowledge of root sound will not help to get into the deeper aspect of the language. Anvaya refers to the logical connection of words, as to how different words relate with each other to convey a significant meaning or idea. Main aim of अन्वय is to arrange the words following the sequence of ideas flowing as thoughts. Its purpose is to decode, enter into the mind of the poet and grasp the spirit behind the thought. अन्वय (Anvaya) = अनु (Anu) + वय (Vaya). Anu means to follow and Vaya means to weave. If you observe closely, अन्वय prepares your mind for the realisation of what is behind a particular verse. This is the secret of the mantras, sounds, and verses in Sanskrit. It prepares the mind for realisation by following the train of thoughts like this and realise the spirit of what is being said. However, it is not to be misused for converting poetry to prose. If you are a beginner in Sanskrit (like me) and you just have words to express your idea, then you simply arrange them the way in which you think without worrying about the order. You simply put the words anywhere you want. For example, you want to say the boy goes to the school in the morning. You can translate this sentence like this – बालक: (The boy) गच्छति (goes) विद्दयालयम (to the school) प्रात:काले (in the morning). Now in other languages you will not be allowed to put words in any order. However, in Sanskrit you can put words as it appears in your train of thoughts. So if you happen to go from right to left instead, you can say – प्रात:काले (in the morning) विद्दयालयम (to the school) गच्छति (goes) बालक: (The boy) and it is perfectly valid. If you happen to spot words randomly to gather the meaning of the sentence you can also say – गच्छति (goes) विद्दयालयम (to the school) बालक: (The boy) प्रात:काले (in the morning). Again this is perfectly valid Sanskrit. You simply put down the words in any order and express your idea. This to me is a big wow, because we spend so much time re-arranging our words to form a meaningful sentence to convey our idea. So, this flexibility and freedom that Sanskrit allows works with the grain of thought and not against the grain of thought as with other languages. So this was then followed by reflection and Q&A session, bringing us to the end of introductory session on धातुरहस्य.